Our office is located directly above Anytime Fitness. Click image to see how to get into our parking garage at the Lakeview Building. Use the Metro Trip Planner to find the right bus to get to us! #26, #28, #31, #32 and #40 are located the closest to our office. Exit at Fremont Avenue North and North 34th Street. Walk east on North 34th Street for one block until you see the JP Patches statue and Anytime Fitness. Use Google Maps to help navigate your journey! We offer guest parking under our building for 2 hours or less. While driving on North 34th Street, turn down Troll Avenue towards the water. The Aurora Bridge will be directly above you. At the stop sign, take a right and then another immediate right into the Lakeview Building parking lot. Drive straight to the back of the lot and on the left hand side, you will see the parking garage gate with the sign "Lakeview Building Parking" above. Enter the parking garage, take a ticket and park anywhere on 1/P2. Take the blue Lakeview elevator up to the third floor. We'll validate your parking ticket before you leave. Once your ticket has been stamped, you'll have 15 minutes to exit the parking garage. Parking for longer than 2 hours? You'll find several pay-to-park lots nearby. Typical rates are $10 a day or $8 for 3-4 hours. Note: these lots take cash only. Street parking can be tricky around this area but if you do find a spot, it's typically free parking for two hours! Residential areas sometimes have unlimited parking meaning you could park all day. You might need to walk an extra 6-10 blocks but it's worth it if you plan to stay in the area for more than 2 hours. Use the address above and your geosense to find us! All members of your group must have a ticket - including kids. Only 25 people are allowed in our Visitor Center at a time (including children & staff). We must enforce this limit for safety reasons. There is not a wait list for tickets. If you do not have a ticket, you are welcome to wait in line for possible openings. Waiting in line will not guarantee a visit to the HQ cache. The waiting line will be first come, first served, as space is available. Please arrive only 10 minutes before your scheduled ticket time, we do not have a large waiting area. You MUST be on time. If you arrive late we will give your spot to someone waiting in line. If you arrive late, you are welcome to wait in line for possible openings. We expect to be very busy during these dates and times. We appreciate you only stopping in at your scheduled ticket time. When you arrive 10 minutes early, please join the line for the next entry into our Visitor Center. Please have your ticket ready - you can print your ticket on paper or show us on your phone. Visit does not include an office tour. As a working office, we are not able to support office tours. 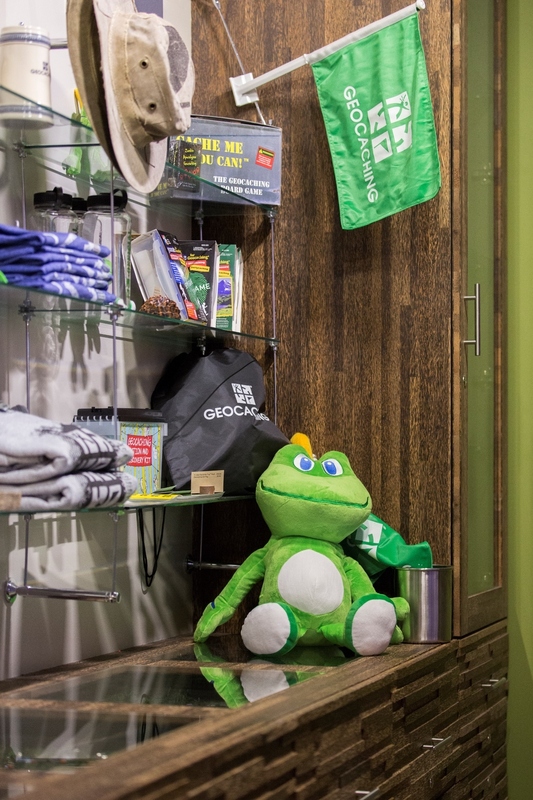 If you didn't complete it already, the Geocaching HQ GeoTour is an awesome way to explore our neighborhood! There are lots of things to do and see while here at Geocaching HQ and the Fremont neighborhood. Check out our Things To Do guide for ideas of other things in our neighborhood to see and do! At the end of the week, check back on our Photo Booth page to see your photo booth pictures and updates from our week of awesome visitors! Feel free to share them with your friends and family - and encourage them to come and visit us, too!